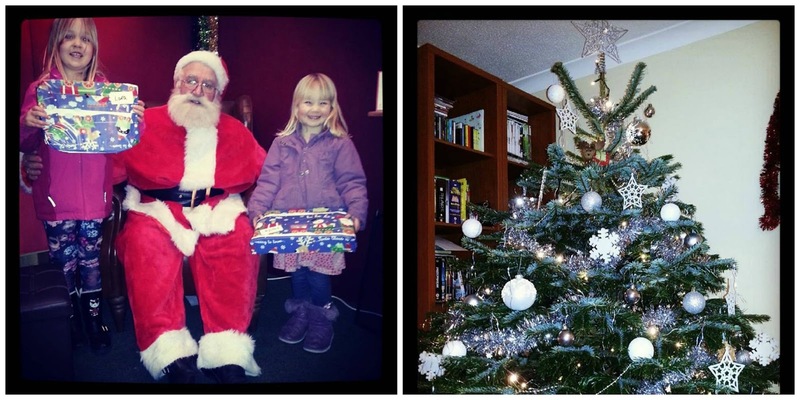 We had a really wonderfully festive day today. One of those days which really gets you into the Christmas mood. After swimming lessons and Rainbows this morning we headed over to Reading for a spot of Christmas decoration shopping and a festive meal at TGI Fridays. 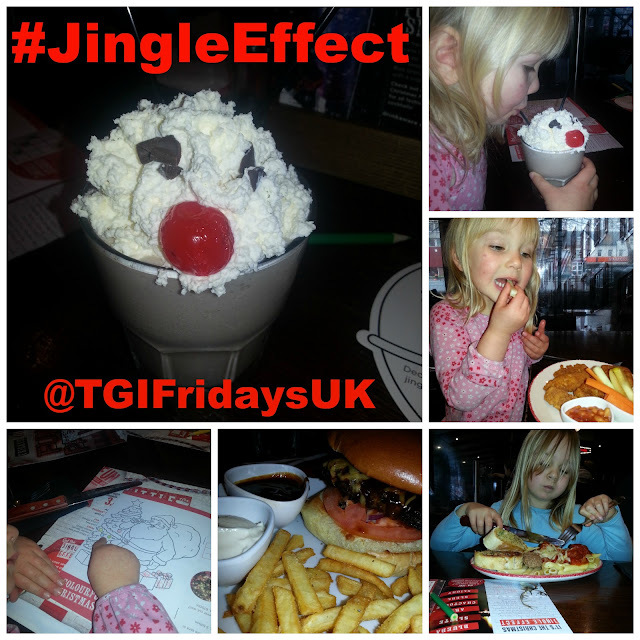 TGI Fridays had invited us to experience their festive fun this Christmas. Their children's menu has received a festive makeover with options for both smaller appetites (The Little League) and larger appetites (The Major League) from just £4.99. The most fun thing on the festive menu being a gloriously exciting Rudolf milkshake topped with whipped cream, chocolate eyes and a big fat cherry for a nose. The girls LOVED this chocolate milkshake. For grown ups you can ask for the #JingleEffect menu which has also had a bit of a festive makeover but we stuck to our favourites - I chose a very yummy burger topped with pulled-pork, choose and BBQ sauce. Lara's major league meal of meatballs, pasta and garlic bread was a portion big enough for an adult... and she very nearly ate it all! Holly chose Chicken Tenders with crudites, waffles and beans. The girls both received a fun pack to keep them entertained while they waited for their food - the pack contained Christmassy puzzles, colouring pictures and festive facts. While we were waiting for our food, the girls got busy colouring in their #JingleEffect bells with their own designs and, as we left the restaurant, they hung their bells on the big Christmas tree at reception. We thought the staff and food at TGI Fridays in Reading (Caversham Road) were perfect - we had a fabulous lunch and it really set our weekend off to a wonderful Christmassy start without losing that American style. The best moment of the meal was when Lara pointed out that there were black music circles on the wall of the restaurant... they would be vinyl records my dear! After lunch the girls had a quick nap before we went shopping for a Christmas tree. We surprised them with a visit to see Father Christmas - the girls were soooooo excited and totally enthralled by the magic. In the evening we decorated our tree together. It is beginning to feel a lot like Christmas!